simple chords suddenly awoken by incredibly fast runs in unison with the bass- one of the amazing variety of timbres in the trio …..
one of Tsourelis’ heroes is John McLaughlin (and his 80s/90s trios with Trilok Gurtu) and you could hear a strong influence. …..
Eric Ford’s sensitive cymbal work was complex, tiny beats scattered between the strokes of the cowbell, often following the rhythm of the melodies… the full drum sound allowed guitar and bass to play in unison without the sense of anything missing …. 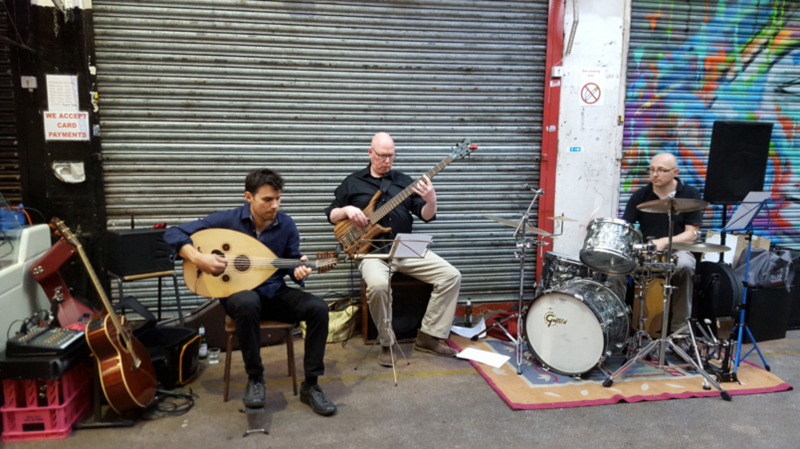 There were time signatures to keep you on the edge of your seat throughout the gig, here 6/8, then 7/8 – Tsourelis studied Greek lute, and its rhythms, in Greece before being introduced to the oud by his teacher…. There was a wonderful sense of the trio grooving together very intuitively ….. 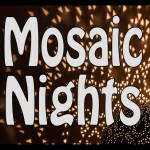 The gorgeous chord melody head and Metheny-esque solo lulled us, the repeated phrases recurring like waves…..
moody and minor, with fast, rising, almost flamenco riffs caught in the net of the spacey chords …..
Spancil Hill, an Irish tune, was the only one not written by Tsourelis, and the sweet melody nestled among oriental trills. Dave Jones’ solo was beautifully melodic as well as percussive ….. 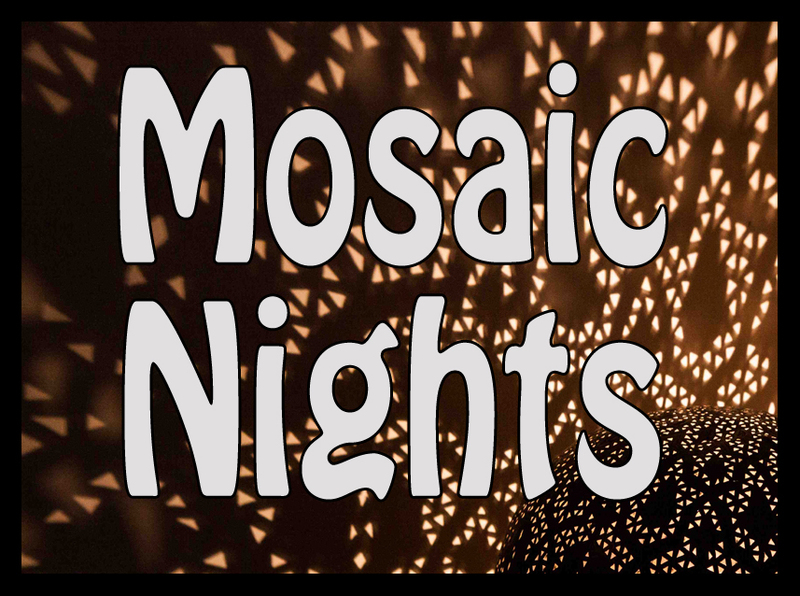 Presented by Mosaic Nights… A monthly series of concerts curated by cellist Shirley Smart, the series features bands and projects which lie in the spaces between jazz, world, folk and classical music.